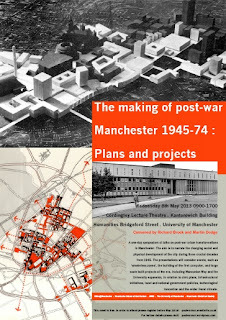 I am convening a small 1-day symposium on the histories of urban change in the post-war period, looking at a range of different plans and projects relating to Manchester. The event is being held on the 8th of May and is being co-organised with Richard Brook in the Manchester School of Architecture. It is free to attend and you can register for a ticket from here. We think we have put together a strong programme. The presentations will consider events, such as ‘smokeless zones’, the emergence of a computer cluster in the city, and large scale built projects of the era, including Mancunian Way and the University expansion, in relation to civic plans, infrastructural initiatives, local and national government policies, technological innovation and the wider fiscal climate. Speakers include Michael Nevell from Salford University talking on 'From Industrial City to Industrial Archaeology', from Bangor University we have Peter Shapely discussing 'Social Housing in Post-war Manchester' and Professor John Pickstone who will examine 'Health and Hospitals'.